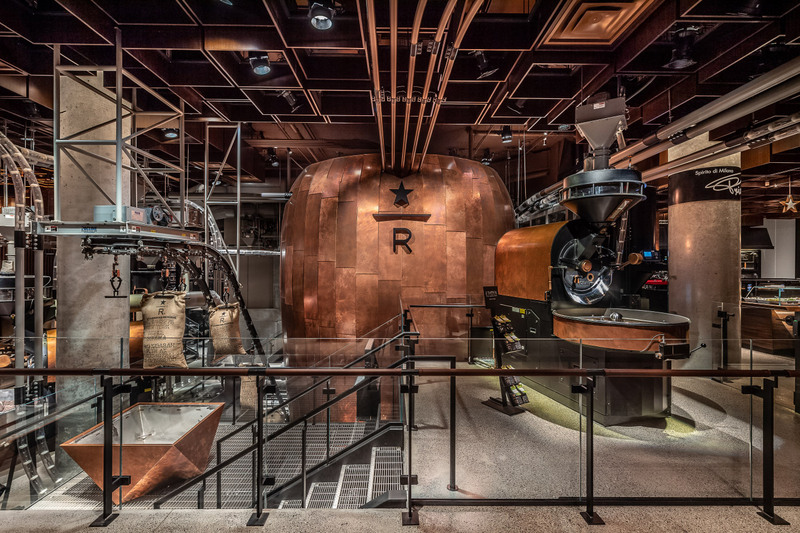 New Yorkers can now experience their own Starbucks Reserve Roastery, the coffee company’s sprawling “upscale” take on the typical Starbucks typology, and AN was able to tour the new location ahead of its December 14 opening. Reserve Roasteries are Starbucks’s largest spaces—the 30,000-square-foot Shanghai location is the largest Starbucks in the world—and the new Meatpacking location is no different, clocking in at 23,000 square feet and covering multiple levels. 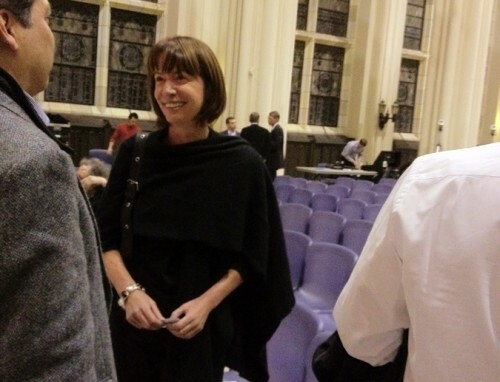 The flagship store, which anchors the base of the Rafael Viñoly–designed 61 Ninth Avenue, has been imagined as an all-day destination, according to Starbucks’s chief design officer, Liz Muller. A Starbucks location already exists directly across the street, but Reserve Roasteries are meant to be more experiential than the normal stores. Case in point: The Meatpacking location contains several distinct zones that encourage guests to wander and browse. At the roastery’s ground floor is a 360-degree central coffee bar, a lounge (complete with an active fireplace), an active roasting area with a 30-foot-tall copper off-gassing kettle, a separate counter and kitchen for the Italian bakery brand Princi, a station where customers can buy and grind their own beans, and several merchandise stands offering high-end design items. A lounge with another coffee bar sits below-grade and is meant to offer a quieter, uninterrupted experience where guests can work. On the top level is the 60-foot-long Arriviamo Bar, a cocktail bar with seating for up to 80, where bartenders will sling mixed drinks made with Starbucks coffees and teas. The interior is rife with nods to the Meatpacking District’s industrial past. The building’s concrete columns have been left exposed, and terrazzo was used for the flooring. In a Willy Wonka-ish touch, pneumatic tubes crisscross the ceiling to deliver freshly-roasted coffee beans from the roasters directly to hoppers at each coffee bar. Muller described being inspired in part by the conveyor belts that butchers would use to transport carcasses back when the area was used to process meat and dairy. To help modulate the acoustics of such a large space, the in-house design team covered the ceiling in solid-timber boxes that both break-up noise from below and naturally amplify the store’s speaker system. The undulating pattern of the boxes is reminiscent of an ocean wave, and each box is rimmed with copper to impart a soft glow. A series of wooden slats set with recessed lighting was used to clad the ceiling of the below-ground lounge area, creating visual homogeny with the vertically-oriented screen that wraps around the store’s edges. If visitors venture further back into the cellar, they can catch a glimpse of the basement storage area where green (unroasted) coffee beans are kept, and a terrarium full of coffee plants imported from Costa Rica. The furniture was all custom-crafted by BassamFellows from solid walnut, including the backless stools, extra-wide riffs on the classic Kennedy chair, side tables, and the wheeled-display stands. Each Reserve Roastery features its own unique central art piece, and for the New York store, Starbucks installed a 10-foot-tall, 2,000-pound version of the siren from their logo rendered in copper. The piece was designed by artist Max Steiner and fabricated by the Polich Tallix foundry. Those in the Midwest: don't fret. 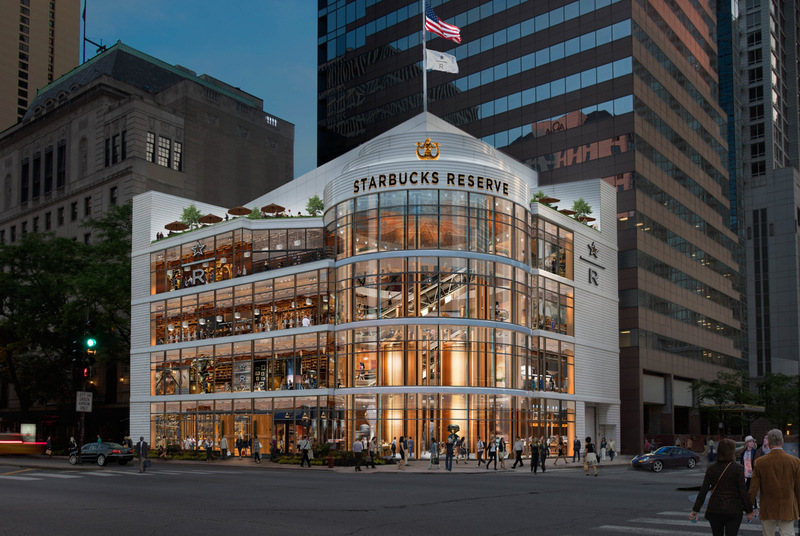 Starbucks is still on track to open its largest outpost yet in Chicago next year: the four-story, 40,000-square-foot Reserve Roastery at 646 N. Michigan Avenue. After the passage of a tax on mega-companies that seemed like a victory for Seattle’s affordable housing advocates less than a month ago, Amazon, Starbucks, and other Seattle-based businesses have banded together to lobby for its repeal. The strategy seems to have worked, and Seattle’s City Council met today to consider rolling back the tax ahead of a November referendum forced by the business community. Business groups raised over $200,000 after the passage of the so-called “head tax,” which would have billed companies grossing $20 million a year or more $275 per employee (bargained down from $500) for five years, to gather the signatures required for a repeal referendum. Whether the referendum would have been held or not, the pressure generated has caused Mayor Jenny Durkan and the City Council to act. In a statement released yesterday, The Mayor’s office pledged to consider repealing the tax, which originally passed with unanimous City Council support. “It is clear that the ordinance will lead to a prolonged, expensive political fight over the next five months that will do nothing to tackle our urgent housing and homelessness crisis. These challenges can only be addressed together as a city, and as importantly, as a state and a region. “We heard you. 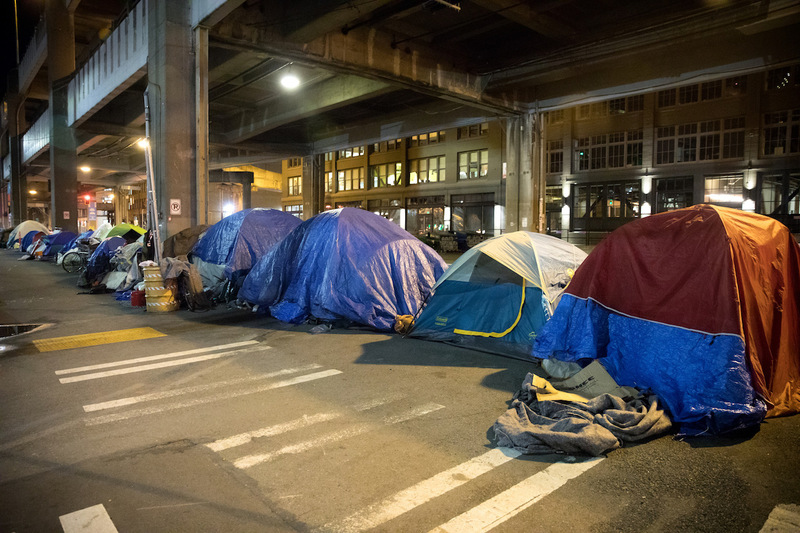 This week, the City Council is moving forward with the consideration of legislation to repeal the current tax on large businesses to address the homelessness crisis.” Amazon had originally threatened to halt all expansion in Seattle when the first iteration of the head tax was floated by officials, but backed down and resumed construction on their downtown projects when the measure passed. The tax would have raised $47 million for the construction of 591 units of affordable housing throughout Seattle and services for the homeless. CMs Herbold, O’Brien, González all acknowledged they don’t think they could have out-fundraised the opposition campaign on the November ballot. González: We pursued a process of nine months to do outreach, to talk to people, to make concessions that we never wanted to make." In a late afternoon voting session, it now appears that the head tax has been repealed by a 7 to 2 margin.